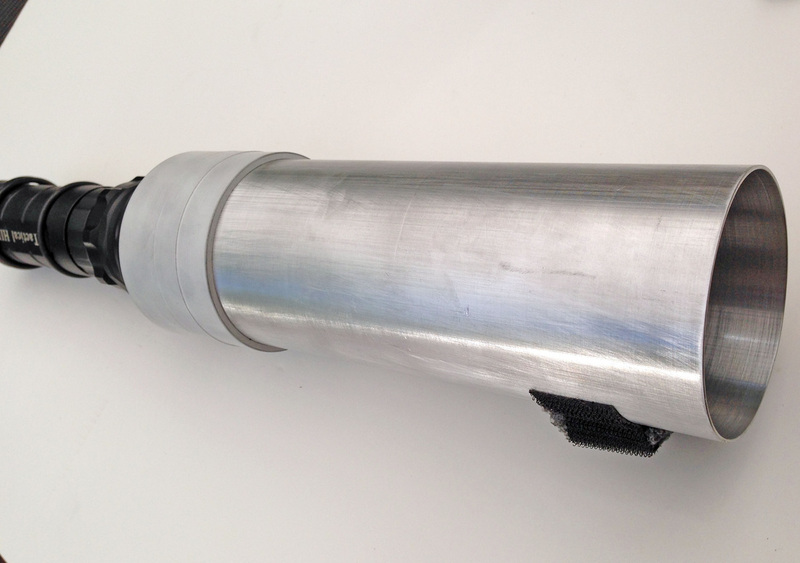 Integrated carbon fibre fixed length (non-telescopic) staff with counterbalanced camera traveller with 400mm height adjustment. 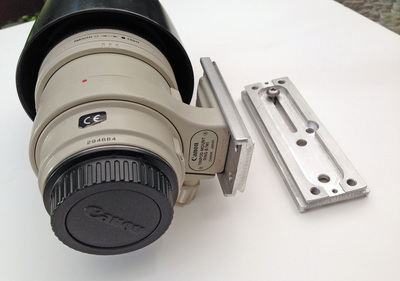 A counterbalanced head with 300mm travel specifically to fit a leg from a Gitzo tripod GT3541XLS. 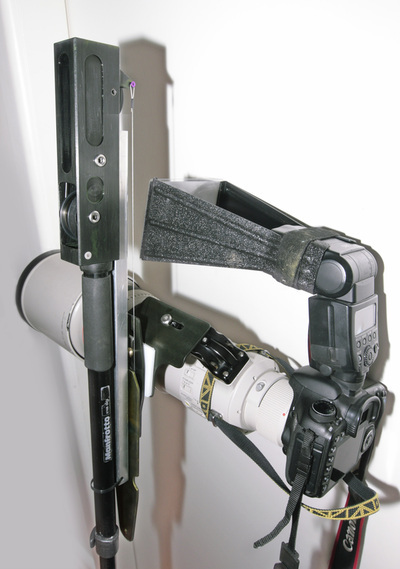 Designed for lightweight air travel where only a tripod need be packed but when a monopod is required then a leg from the tripod can be used with all the benefits of a counterbalanced travelling head. Suitable for all lens weights. Monopod Head Series 3 suit any commercial monopod. Refer recommendations regarding the extended length of the monopod. Monopod Head Series 3 will suit the popular 100-400mm zoom through to 600mm f4 with full frame camera body, flash & light. The counterbalance mechanism gives easy adjustment of camera height but the traveller locking force is proportional to the camera mass, providing a stable position for shooting with any camera/lens combination. 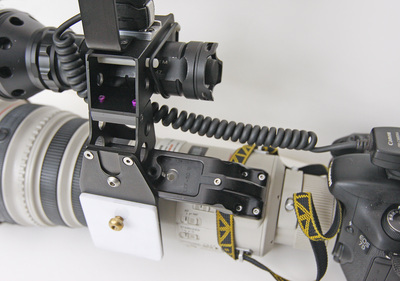 Licole make lens adaptor plates to suit the popular Canon 100-400 L lens. The lens fits into a slot which truly aligns lens & plate & stops it twisting & loosening the mounting screw. 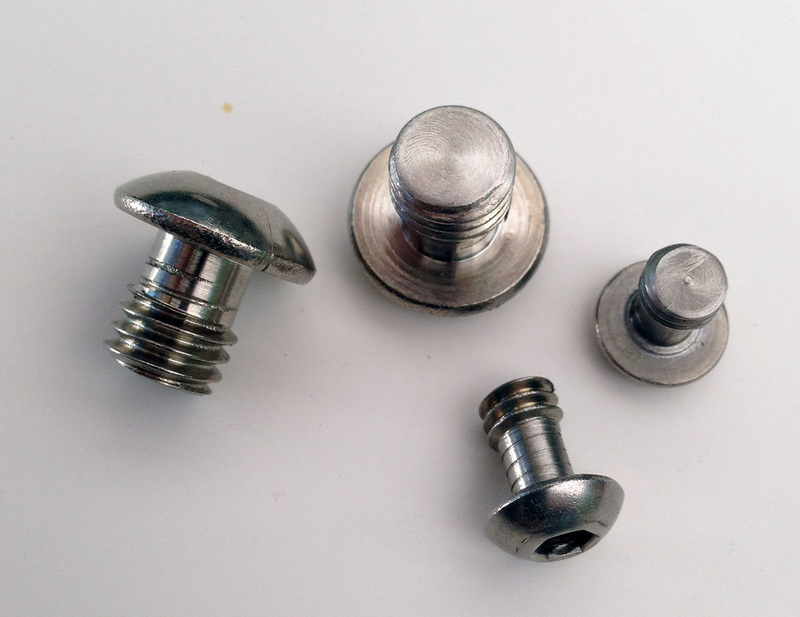 The plate can also be fitted transversely to suit fitting to a macro screw slide at a true 90 degrees. 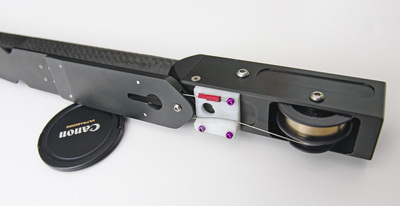 Lens plates have an industry standard 'arca swiss' profile to suit many manufacturers quick release clamps. Plates are available in 2 lengths: 90mm & 125mm. Finish is black anodised aluminium. Licole make stainless steel captive screws suit camera & lens mounting for standard 1/4in & 3/8in threads. Licole make red lens filters for popular LED & HID lights. 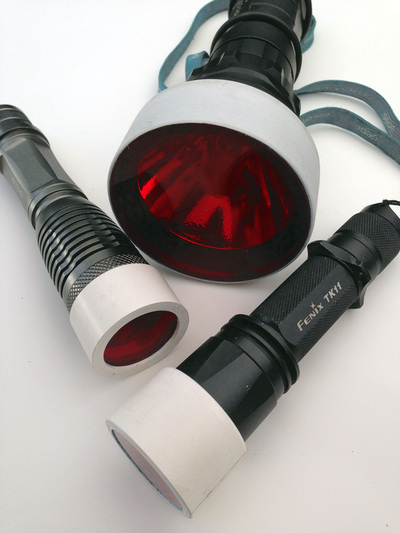 Red lights tend to be less disturbing for nocturnal animals & birds. The light colour is similar to that emitted by the flash autofocus beam, so while the red light does not illuminate like the unfiltered light, autofocus performance remains much the same. 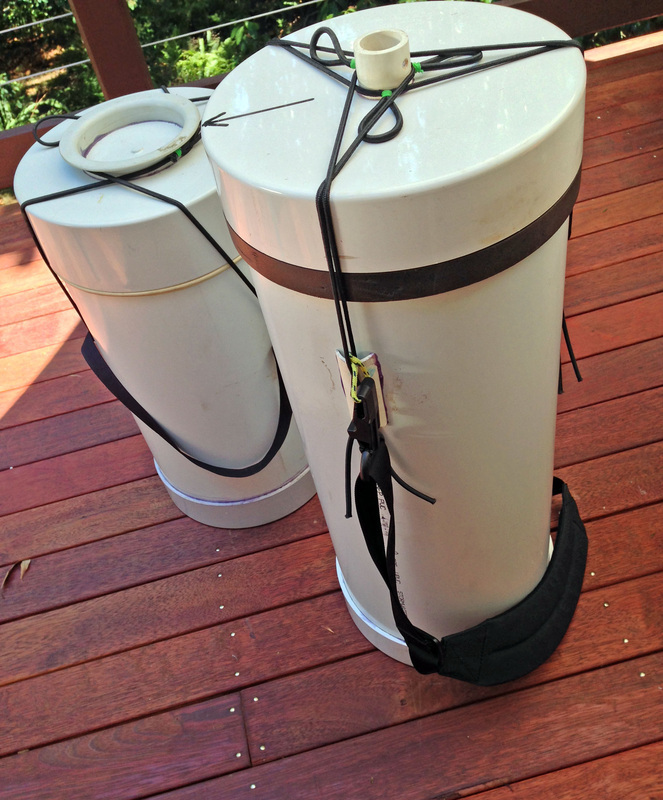 Materials are PVC & acrylic. 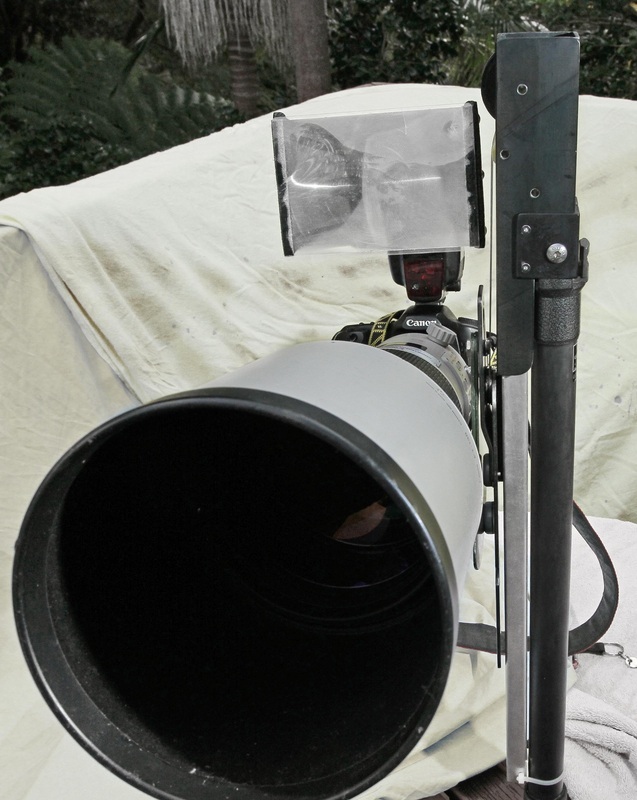 Licole make camera tanks for large telephoto & camera combinations to protect against dust or water. Tanks are available to suit either lens hood stowed or lens hood fitted. The longer tank to suit lens hood fitted is useful for travelling in 4WD or boat where the camera is always in the shooting configuration ready to be withdrawn & fired. Tanks are made of PVC & require foam padding. Do not use polystyrene as it abrades & the tiny particles are statically charged & will stick to your glass. 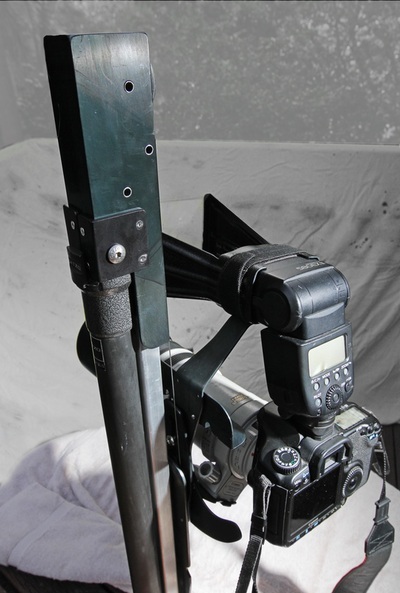 Licole make light mounting brackets for Wimberley Sidekick gimbal mounts & light control tubes to prevent light spilling onto lens barrel & dazzling the photographer. 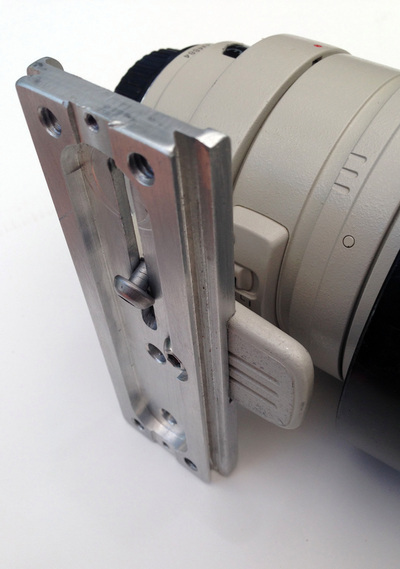 Also Licole manufacture custom brackets for remote flash & light mounting. Shown here is 500mm f4 lens fitted with flash & HID Microfire light & light control tube for night shooting from monopod. The machined mounting surfaces means that all the components set up square & level so that the frame is evenly lit. 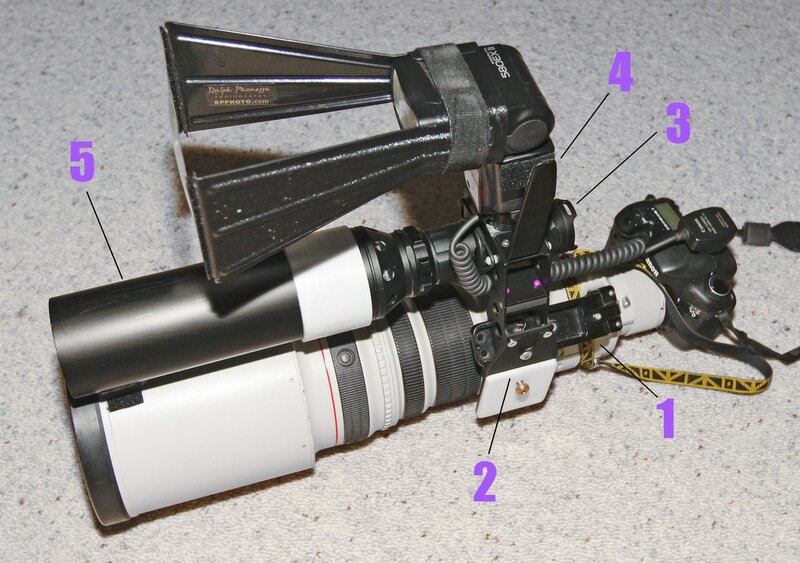 All-up mass is 6.9kg with Canon 7D. 1. Really Right Stuff (or equivalent) Arca-Swiss type lens foot. 2. 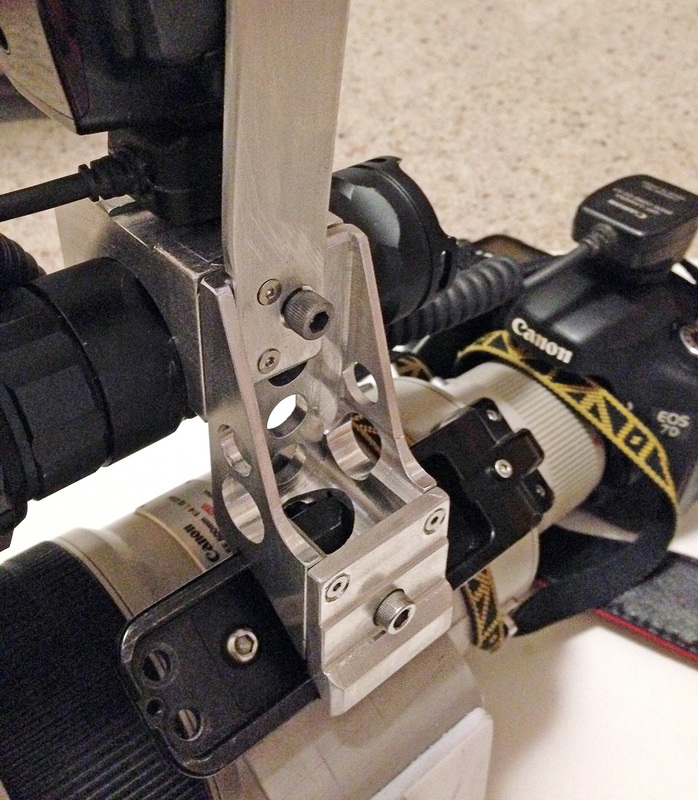 Monopod mounting & Flash Bracket. 3. Light shown is Microfire HID. 4. Flash protection bracket that reduces the loads on the flash foot & the fragile Canon remote cord connection. 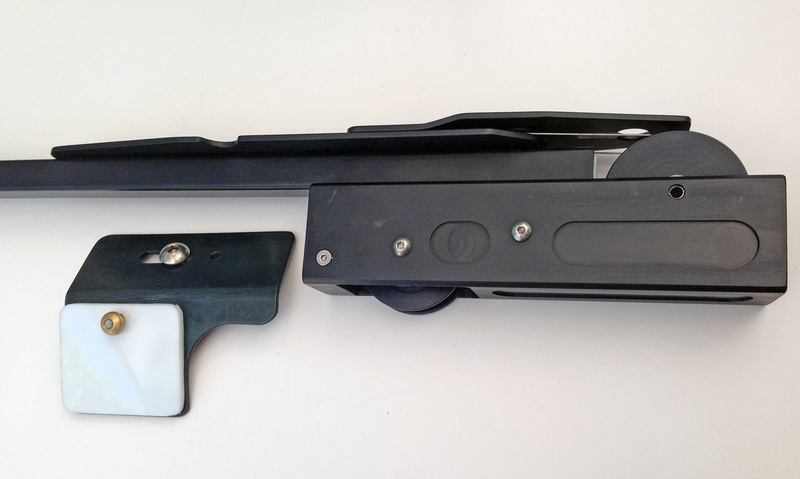 It is (shear) velcro attached & will protect these components from most bumps & snags encountered in bush night shooting. 5. 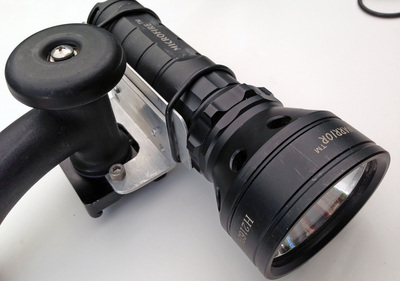 Light control tube eliminates glare from light on barrel of lens.